Today I thought I'd write a post about the different transmissions and differentials that were used on the NC Roadster / MX-5. As with the previous NA and NB generations there are slight differences between the home and export markets which always leads to confusion and misinformation around the internet. 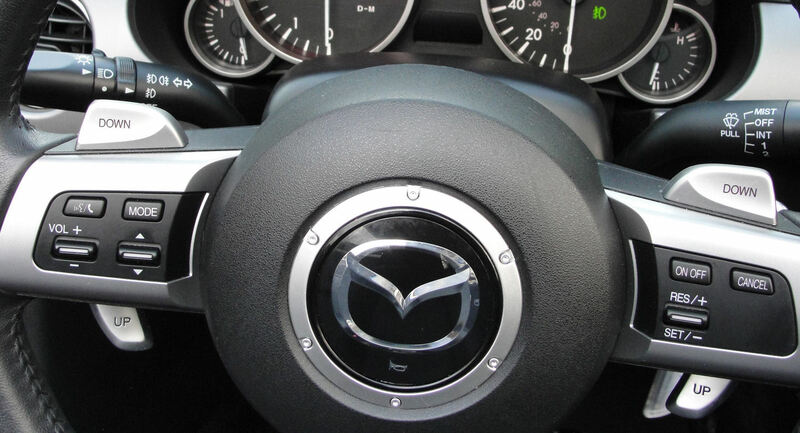 The figures and stats I'll be using here come directly from Mazda's own published brochures and technical specification catalogues so it's just about as good as we can get. In the UK we had a choice of 1.8 litre 5-speed, 2.0 litre 5-speed, and 2.0 litre 6-speed. A limited slip differential was fitted to all 2.0 litre models, though the final drive ratio is different to match the 5 and 6 speed transmissions. Mazda used the simple and cost effective Super LSD type which uses cone shaped clutch plates in addition to gears, rather than the helical gears Zexel Torsen branded differential used in the earlier models. I think it's worth mentioning here that "Torsen" is a brand name owned by Zexel and formed from a portmanteau of "torque sensing". Zexel has since undergone a name change to JTEKT Torsen North America Inc after joining Japan's JTEKT. 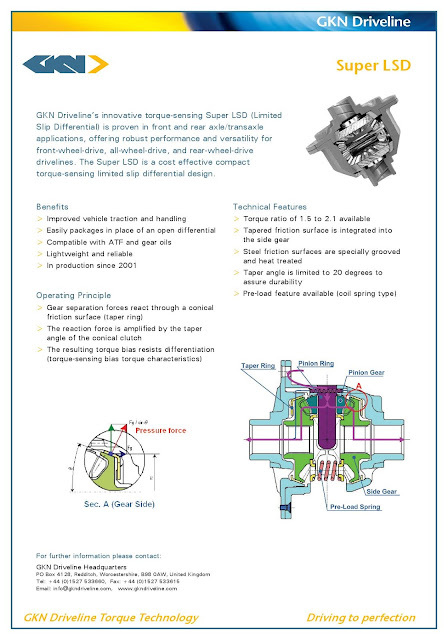 The Super LSD also works on the principle of torque sensing but isn't a Torsen since it is designed and manufactured by a different company. The Super LSD has a torque bias ratio of 2.0 and provides initial torque of 49Nm for improved starting from standstill. This initial torque means that even when one rear wheel is lifted off the ground, drive can still be transferred to the wheel that has grip. This is an advantage the clutch type differential has over a helical type which would not be able to transfer any torque if one wheel is off the ground. 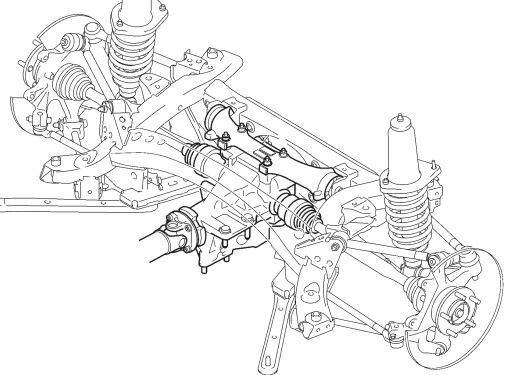 The downside is that clutch type differentials are subject to wear, while helical types are largely maintenance free. 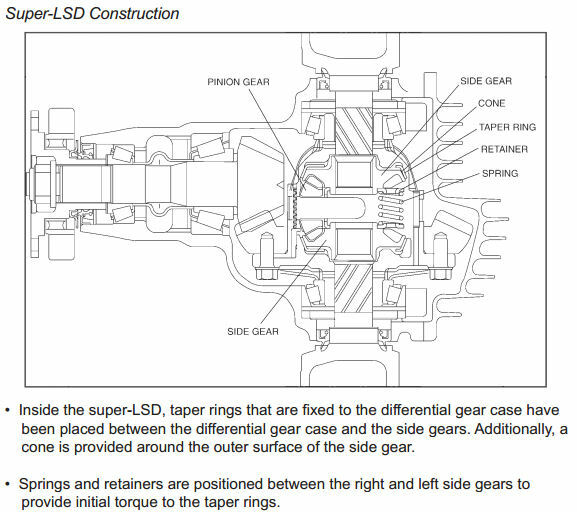 The Super LSD is a simple design that helps reduce weight. Let's take a look at gear ratios and final drive options. You can see below that both 5-speed cars used the same gearbox and had a 4.1 final drive whilst the 6-speed had a 3.7. Also note that 4th gear in the 5-speed is equivalent to 5th gear in the 6-speed. Roadster Coupe (RHT) models had the same transmissions as their soft top equivalents. With the NC2 (Mk3.5) upgrade revisions in 2009, there were some changes to the 6-speed gearbox to improve performance. This later gearbox features a new carbon coating on the 1st through 4th gear synchros and larger diameter synchros on 3rd and 4th gear to further improve the shift feel and action. The trim level names also changed with the base model becoming "SE" and the previous Sport changing to "Sport Tech" or "Sport Tech Nav" if you wanted one with an integrated navigation system. A 6-speed automatic gearbox option was introduced as the "PowerShift" models. The final drive ratio for the 1.8 SE was changed to a 3.9. Also note that with the second facelift (NC3), the 2.0 5-speed SE model was phased out and no longer available. That about covers the UK cars, but what about Japan? Well the important thing to note here is that the 1.8 litre engine doesn't exist. Great, that makes my table much simpler. Also, there are a few differences between the UK 6-speed manual gearbox and the Japanese version so I've included an extra column for comparison. I'm not sure why the first three gears in the JDM 6-speed are different, but the difference in final drive between UK and Japan is likely to do with highway speed limits and acceptable revs at motorway speeds. The facelifts in Japan had some minor changes to the lineup with the base model now being referred to as the S, and of course there are the RHT (Retractable Hard Top) variants with some models disappearing such as the soft top VS. The only real change of note is a revised taller 6th gear for the manual 6-speed that was also used in the USA but we didn't get in the UK, meaning the two different 6-speed boxes share only 4th, 5th, and reverse. Again I've included a UK comparison column below. Enough with the numbers, what does this Super LSD actually look like? It is made by a company called GKN Driveline Torque Technology (part of the UK's GKN Driveline group, based in Worcestershire), which is the new name for Tochigi Fuji. 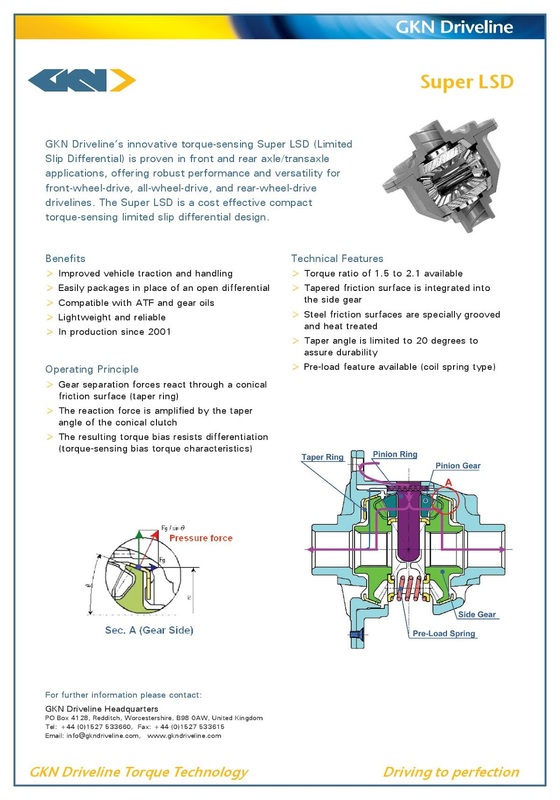 You can read more about the Super LSD on GKN's website and take a look at their product data sheet which I have reproduced for reference below. If you've been following closely you'll see that there appear to be two different Super-LSD, a 4.1 and a 3.7, and two different open differentials, a 4.1 and a 3.9, all of which were likely supplied by GKN. I may well be wrong but that is what it looks like from the information I have. Oh and just to add another spanner in the works, there was an optional Mazdaspeed 2-Way LSD too. Now since GKN Driveline also make a high performance Helical type LSD, I wonder if this is what the Mazdaspeed differential is. There's not much information to go on but it is more expensive than the standard Super LSD, costing around £600 new and is believed to be more suited to race and trackday use. The part number for this is QNCA-27-200 or QNC1-27-200 if you wanted to look it up.